If history counts for anything Peugeot knows how to make a hot hatch. Some would say it’s responsible for the greatest hot hatch ever, the legendary 205 GTi, which went and ruined everything for all the other hot hatches when it showed up in 1984. Peugeot nutters might claim the closest the brand’s got to capturing the spirit of the 205 is the 1996 306 GTi-6 – with a close-ratio six speed ’box and a rorty 131kW 2.0-litre engine, it was sublime. 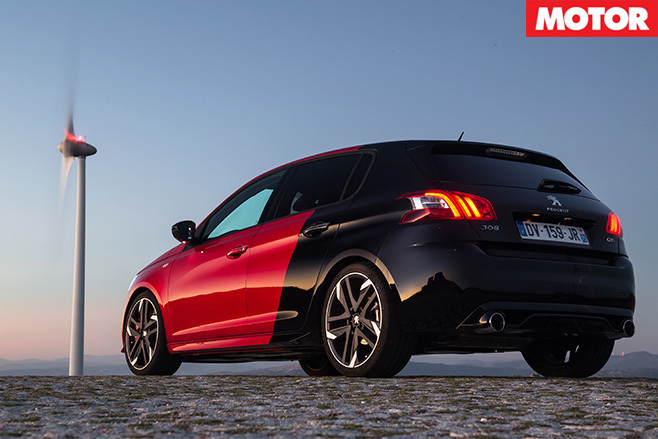 The latest of this particular, larger hot hatch dynasty is this – the 308 GTi. It’s got a lot to live up to. 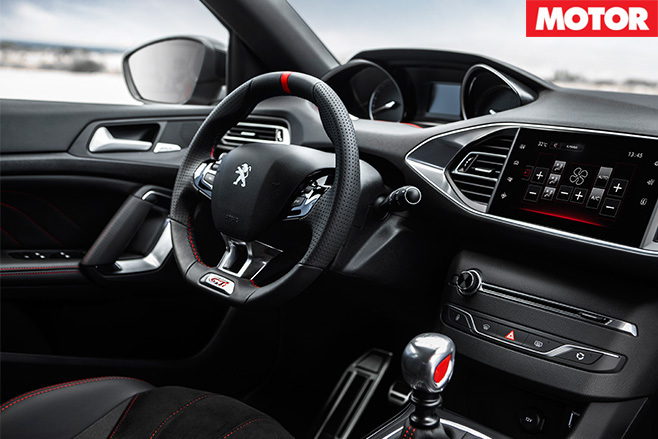 Peugeot’s taken the 308 GT, lowered it 11mm, given it new, angrier front bar and wheels, completely revised the suspension and prepared a pair of wicked-up engine tunes. But crucially, to the hero model at least, it’s fitted a proper mechanical front limited slip differential. Two versions are coming to Australia, the 250 and 270. 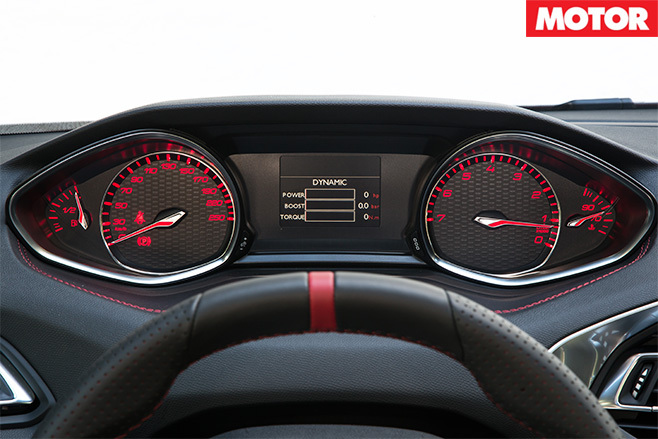 Both are five-door, weigh a reasonably scant 1205kg (a Golf GTI is 1324kg), are six-speed manual only, and powered by the same 1.6-litre turbo-four – in differing states of tune. They both boast 330Nm from 1900rpm, but the 250’s torque runs out at 4000rpm to the 270’s 5500rpm, and the 250 has 184 kilowatts to the 270’s 200. The 270 does 0-100km/h in 6.0sec, 0.2 faster than the 250. We only drove the 270 on the international launch in Portugal but we suspect the snugger seats, more aggro tyres and particularly the differential – all things the 250 doesn’t have – will make more of a difference to the driving experience than the power might. From driving it, it’s clear Peugeot engineers weren’t going to compromise on performance in the name of refinement, at least in 270 guise. The suspension is firm but certainly not intolerable, and the focused 19-inch Michelin Pilot Super Sport tyres on the noisy side. But hammer into your first corner and the 308 GTi sits remarkably flat and offers up a generous reserve of mid-corner grip. The diff lets you blast out of bends aggressively and encourages a rhythm of neck-wringing that befits a proper hot hatch. Other pluses include the steering, which is one of the nicer electric systems we’ve used lately. And the engine – flexible right across the rev range, and punchy. The grunt is certainly decent. Gripes include a woolly, unsatisfying long-throw gearchange; getting spooked by the occasional bout of minor torque steer; and a slightly dud engine note, inside the car at least. Peugeot plumbs fake engine noise through the stereo in ‘Sport’ mode which adds to the drama, but it’s obviously fake. The car sounds better from the outside. At least you can put the windows down and enjoy some turbo whistle and a little blow-off-valve sneeze. On track the Pilot Super Sport tyres start to make a lot of sense, with a delicious reserve of available grip letting you carry more and more mid-corner speed. And the diff really comes into its own – none of this frustrating inside-spinning wheel malarkey here. In fact, on track the 308 GTi is a bit of weapon. It’s got enough grunt to keep the knuckles white down the straights, and brakes such that you’ll be going deeper and deeper past your braking markers with each lap. Turn the ESP off and it gets a bit feral, spinning up both front wheels fairly easily. But generally the 308 GTi is more planted than playful, showing off some mid-corner adjustability with a throttle lift but without the homicidal oversteer of a Focus ST or Renault Sport Megane. It surprised us, the 308 GTi. It’s actually quite good – and a worthy hot hatch. As fun as a Megane? As polished as a Golf GTI? It seems to sit between the two, but we’ll know for sure when we do a comparison for the magazine early-ish next year when the car arrives in Australia. 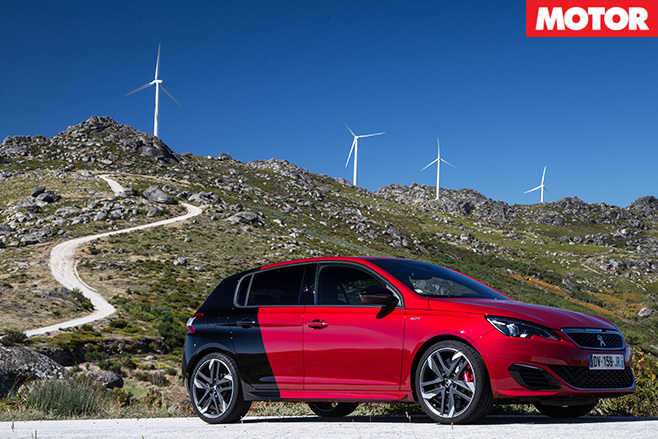 The price will really determine if the 308 GTi is a success or not – between $45K-$55K, says Peugeot. We hope it’s not $55K because the 308 GTi is certainly good enough to play Golf, but perhaps GTI, not R.